Duchess Kate: Vote for Kate's Best Coat of 2015 & William and Harry's Most Delightful Interview Yet! Vote for Kate's Best Coat of 2015 & William and Harry's Most Delightful Interview Yet! Good evening, we hope 2016 is off to a great start for you all! We're back with our first post of the year and as promised we're hosting our annual polls, asking readers to vote for their favourite pieces worn by the Duchess of Cambridge in 2015. It's become customary to begin with Kate's coats simply because she has such an outstanding collection from a plethora of high street brands and designers. The Duchess added a number of new additions to her closet this year as well as bringing back favourites she's previously worn. Kate selected the Séraphine 'Natasha' Cashmere Blend Coat for a day of engagements in Kensington. The soft mist-blue garment features mother of pearl buttons, a collarless style, a sleek straight cut, and stylish faux pockets. It is described as "an elegant addition to your wardrobe for before, during, and after pregnancy". It's a gorgeous coat and without question a strong contender for a winning choice. In February Kate wrapped up in the Max Mara 'Villar' Belted Wool Coat for a visit to Portsmouth. 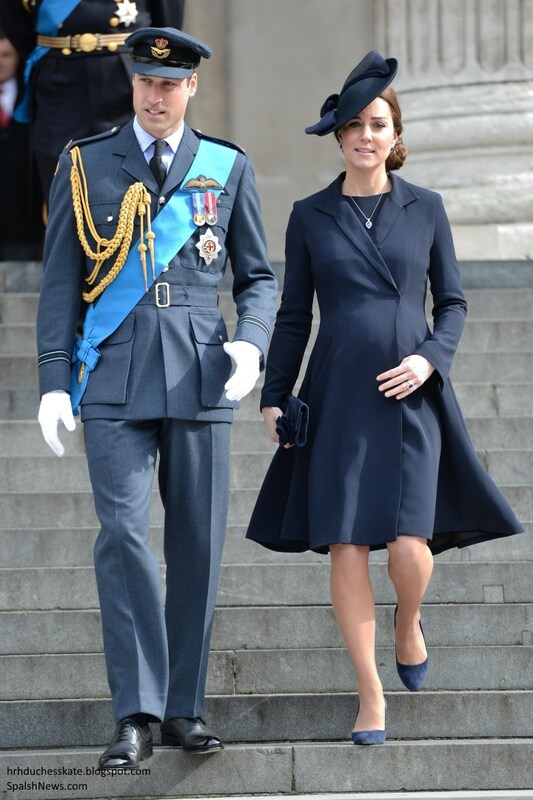 The classic double-breasted coat served as another good maternity choice for the Duchess. The 100% wool piece originally retailed for £580. During a visit to Action for Children's Cape Hill Centre, Kate debuted a new coat by SportsMax. The stylish blue piece is from the brand's 2014 Collection. 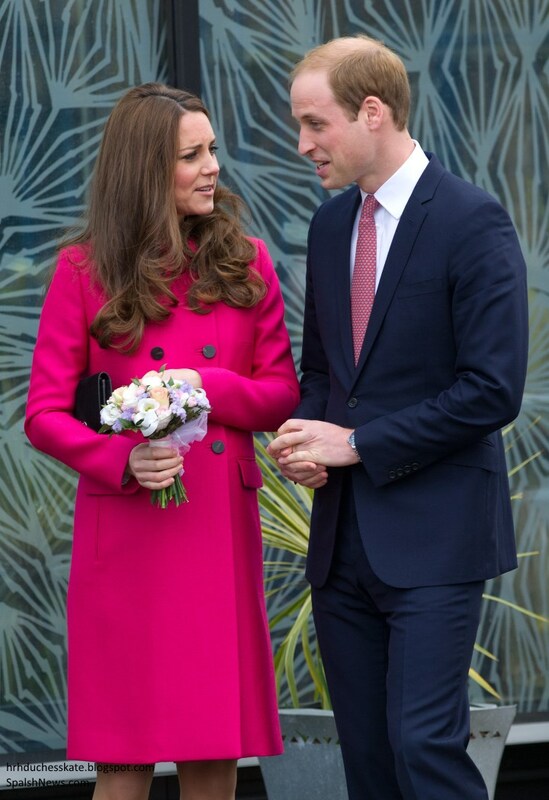 Kate repeated her pretty pink bespoke Alexander McQueen coat for the Commonwealth Observance in March. Kate first wore the coat for Trooping the Colour in 2013 when she was expecting Prince George and it was the perfect occasion to give it another outing. Kate brought back another coat from her first maternity wardrobe - the Hobbs Dalmatian Print Coat - for a day of engagements in Margate. The Duchess first wore it when she christened 'Royal Princess' and it caused quite a stir as the choice of print was something of a departure from Kate's usual style. For Kate's visit to the set of Downton Abbey she was elegant in a cream coat by British maternity brand JoJo Maman Bébé. The appropriately named 'Princess' Wool Coat is described as "a great investment piece for your maternity wardrobe". The wool-mix fabric gives it a luxurious, cosy feel. The collarless garment features front slant slip pockets, tonal topstitching and panel seaming. The Beulah London Chiara Trapeze Coat proved a popular choice for a service of commemoration. The coat was described as "extremely flattering" with a nipped in waist and soft folds at the hem. I thought the entire look was very regal. On St. Patrick's Day, Kate opted for a chestnut brown Catherine Walker coat. The wool crepe piece was a beautiful fit and it was interesting to see her choosing a colour other than green for the event. Kate wore her very popular sleek black coat for a visit to Brookhill Children's Centre. Kate's had the piece for several years, with the Palace confirming it's by her "private dressmaker". For a day of engagements in South London, Kate chose the cerise Mulberry coat she first wore in New York in December 2014. The double-breasted coat is a double crepe wool/silk blend. It originally retailed for £1,500 before selling out shortly after Kate first wore it. It is described as "a timeless winter style with a reassuringly classic silhouette". It was a floral-print Catherine Walker design for Trooping the Colour - Kate's first official appearance following Princess Charlotte's arrival. The 'Astrid' coatdress features a contemporary pencil line, neat rounded collar, and is sharply tailored in a crisp textured woven ivory and ice blue silk. The Duchess was effortlessly elegant in a bespoke McQueen coatdress for Princess Charlotte's christening. The cream fit and flare design is a timeless piece with a striking neckline and exquisite tailoring. The piece was clearly designed with complementing the christening gown in mind. Another fantastic collaboration between Kate and Sarah Burton. Kate wore her much-loved Hobbs 'Celeste' coat for a Crathie Kirk service during the Cambridges' Balmoral visit in September. The Duchess purchased the wool crepe piece in 2011 and has worn it several times since. For the Ruby World Cup opening ceremony, the Duchess wore the very chic Reiss 'Emile' Sharply Tailored Coat. The bright blue coat features a stand-up collar, a single button fastening and two front pockets, and is neatly panelled to be figure flattering. The 'Emile' is from the brand's Autumn/Winter 2014 Collection. The Countess of Strathearn was stylish in a beautiful bespoke Christopher Kane coat and matching kilt for a day of engagements in Dundee, Scotland in October. Tailoring really is key when choosing a coat and the slim-fitted dogtooth coat was impeccably tailored. On Remembrance Sunday, Kate wore a bespoke double-breasted McQueen coat with velvet trim. For an away day in Wales, Kate repeated her popular Reiss 'Angel' coat. First worn publicly on Christmas morning in 2011, the fit and flare style is clearly a favourite of Kate. The £325 military-style garment is from the brand's Autumn/Winter 2010 Collection. It features a large wrap around collar and smart multi-stitching detail. Reiss coats proved a popular choice for the Duchess who sported their houndstooth 'Rubik' Coat for a visit to Action on Addiction's Centre for Treatment Studies and again on a shopping outing a few days later. On Christmas Day, Kate was festive in the green SportsMax Long Belted Coat. As with a number of her coats, Kate opted to remove the belt and wear one of her own. Another year filled with memorable coats for the Duchess, and it is simply so difficult to choose just one. A few of my favourites include the bespoke blue Christopher Kane, the ivory McQueen coatdress worn for Charlotte's christening, and the blue Séraphine coat. Which one is your favourite and got your vote? 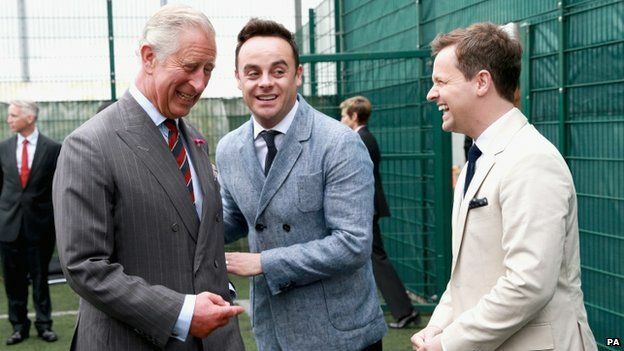 Before we leave you for tonight, we'd like to briefly discuss an ITV Documentary, When Ant and Dec Met the Prince: 40 Years of the Prince's Trust. Over a year, popular presenting duo Ant and Dec had incredible access as they followed Prince Charles on an array of engagements supporting the Prince's Trust. It was very moving to hear stories of young people the trust has helped; there was one scene in particular when a group of young people found out work experience they had gained through the trust would lead to full-time employment during a visit by Prince Charles. It was very moving to see their reaction: genuine emotion and tears. It's amazing to think forty years ago just over £7,000 would go on to create an organisation that has helped almost one million young people. Despite the success of the trust Prince Charles spoke of feeling "he is not doing enough" and his belief in "staying ahead of the game" to ensure the organisation thrives. Charles spoke of his hopes that one day William or Harry will take an interest in the trust and it would be wonderful if they did. Obviously, the young royals will want to make their own mark with their Royal Foundation, but hopefully a way of continuing the successful projects and initiatives created by the trust can be found. The documentary featured a delightfully candid interview with William and Harry at Kensington Palace. Filmed in their old living room, it was splendid to get a peek inside the palace and around the grounds. It afforded a much better view than we're accustomed to seeing from aerial views. The interior looks beautiful and as they entered it was lovely to see a photo of William, Kate and George from their Australia/New Zealand tour. William discussed how fatherhood has made him "more emotional"and noted Harry likes to come over to "scrounge food". I thoroughly enjoyed it and found the informal style utterly refreshing. At present, the documentary is available on YouTube, and hopefully it will remain there. We'll be continuing with our polls next, looking at Kate's gowns and dresses! Ohhh, it is so difficult to choose just one! I loved the brown Catherine Walker Kate wore on St Patrick day was so elegant and I also loved the navy Beulah London Chiara Trapeze coast she wore for the service of commemoration; both were elegant looks from head to toe! After that, my choices would be the Christopher Kate, the Reiss Emile, and the houndstooth. All striking coats IMO. Glad I'm in good company, Ciara. :) I voted for the CW coat because it was my favorite head-to-toe look, including my favorite hat. Flawless, sophisticated, and elegant. Me too. Catherine Walker is the best, my favorite heat as well. I seriously don't know how I made a choice! Every one is beautiful! So fun to look back at each. Thanks for doing this! Haha, same. It was really hard!! This is an impossible choice! But at least I can say undoubtedly which coats are my least favourite: Catherine Walker 'Astrid' Coatdress with floral print which looks like a great choice for upholstery material and McQueen Black Coat - too much for a one coat. I voted on Mulberry Cerise Coat - I love the colour but other coats are also amazing. Charlotte, do you think there's a reason that Katherine doesn't do the interviews which William and Harry? I mean she is part of the foundation. Can you also update your Jewelry page to include the two diamond bracelets and Cambridge Lovers Knot Tiara. I'm going to be updating the jewellery page with all additions from last year. I'm hoping to do separate pages for earrings, necklaces, etc. and think it will make it much more user friendly. I would love to see Kate do an interview, however, I don't expect we will for quite some time. It was lovely to see William and Harry speaking so candidly and letting their guard down a little in the interview. From the royals' perspective it's an excellent means of getting one's message across and allows the public to get to know their personalities. I think that is very important moving forward. I noticed several people on social media mention how the documentary actually showed them what Charles does, what it means to him, the continuity of his work, rather than the commonly held misconception it's all ribbon cutting. I think for this particular interview there is a reason why only William and Harry participated. Ten years ago, William, Harry and Charles gave an interview to Ant and Dec to celebrate the 30th anniversary of the Prince's Trust. It's currently available on Youtube on the Prince's Trust channel. Thank you Charlotte for including the link to the interview. Why do you think that we won't see Catherine do an interview anytime soon, do you have a reason or have you heard something from Royal reporters? Oh what fun, my vote is in! The belulah London was my favorite followed closely by the Christopher Kane one! The princes trust documentary had me admiring prince Charles even more for what he has done for others and his dedication to his charity work. Hopefully he can pass on some of that work ethic and dedication to the younger royals! It is so difficult to choose one!!! They are magnificent!!! Kisses of France, Charlotte !!! So difficult to choose just one! I love the Séraphine Natasha Blend Coat, the Hobbs Celeste, Reiss Emile Sharply Tailored, Christopher Kane and the Rubik Coat. I finally voted for the blue Christopher Kane Coat. Bespoke blue Christopher Kane is my favourite! But I love the cerise hue of the bespoke McQueen coat! I watched the documentary and thought it was very good! Would love to see Kate participating in the future! Thanks, Charlotte! Great post, as always! And to all my fellow royalists, happy 2016! I loved all of the white coats, but went with the coatdress worn for Charlotte's christening. Many of the blue coats were also some of my favorite coats from the year. Oh my. I didn't remember that she wore that many beautiful coats last year. I showed my husband and he picked the Christopher Kane, which is also what I voted for. My second would be the Beulah from the commemoration service. My third would be the McQueen from Princess Charlotte's christening. There are other coats I love on the list but those three are amazing because the entire look is perfect. Accessories, hair, etc. go perfectly with my three favorites. I really like the smoke blue SportsMax coat she wore whilst pregnant and would like to see her in it now. The color is amazing on her. I also cannot help but love the Christmas Day SportsMax as well. To me the entire look is quintessential Catherine and she looks so happy and loved. I love Kate's coats!!! So hard to chose just one. I didn't vote for Christopher Kane because I'm hoping we will have a separates pole. I'll have to come back todo multiple votes. For some reason, I'm not allowed to see the results. What am I doing wrong? Did you click on the "next" button? I love the pop of color on the Mulberry coat. I think people are choosing the christening coat for emotional reasons!! Such a hard choice. Colourwise, I tend to agree with Courtney. Both Sportsmax coats were in colours very complementary to Kate. The particular shade of blue on the first was lovely, not quite as strong as the royal blues she tends to feature but very flattering and the Christmas coat picked up the colour of her eyes. The Walker brown coat was also lovely as was the Christening coat - most elegant. I actually quite like the black dressmaker coat too but it wasn't best served how she wore it. Both Reiss coats are very nice. Not a fan of Ant and Dec but suppose I must endure and listen to the interview. Thanks for link - we are without TV right now. I'm waiting for Erika because I want to know what Catherine thinks. Lol. I didn't ask her bluhare. I'll let her choose right now. LOL!! Out of the mouth of babes, bluhare:) She'll get a kick out of this. Annett, I'm trying to drop a few pounds this year and googling Mozart kuglen -- and finding out I can buy it on Amazon -- is not helping! :) :) Yes, CatHare, I think that will catch on quickly and be a big hit lol!!! Loved the video. Very cute! The most memorable would be the McQueen christening coatdress. But my favorite would be the Christopher Kane coat. The overall look was just perfect. Very Kate. 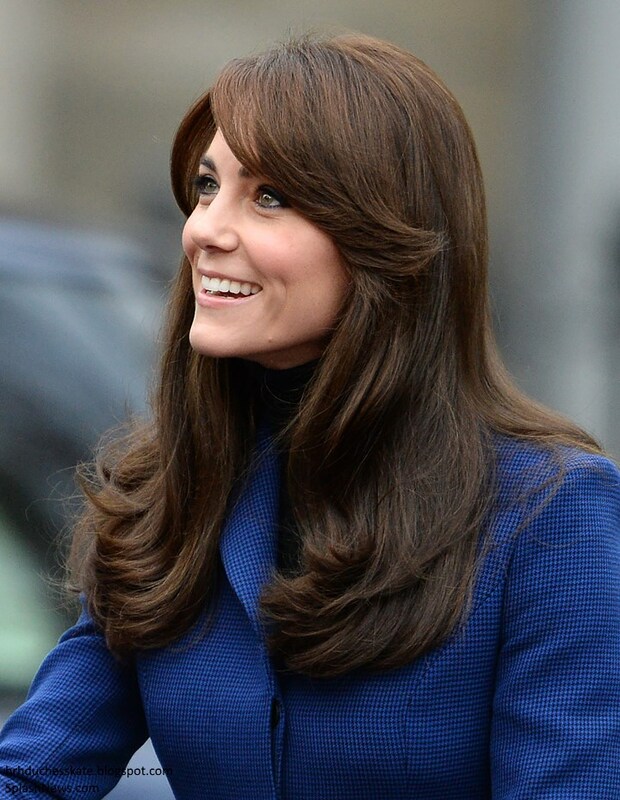 The black turtleneck with the blue skirt was very youthful and chic, almost like a throwback look for Kate. I hope this post doesn't turn into another hate forum, this time let's say hate of all her coats instead of chasing ghosts. It is simply impossible to choose. Why is that an issue even if she did change her name, royalfan? Other people change their posting ID's and/or signatures constantly. I don't see you calling them out. Personally I wish Charlotte would do away with Anonymous posting. That wouldn't get rid of people changing their names all the time, so I'd even be in favor of having to set up an account, and I'd dust off my google one. There is more accountability there, and Charlotte would be better able to track disruptive people, like marg posting insults she knows won't get published. In reality, everyone here is anonymous and it does not matter if someone posts as Bugs Bunny one day and Einstein the next; it really does not .... UNLESS there is an element of mocking mixed in. Recently, when Charlotte posted a comment pertaining to abuse that was directed at her and indicated that the situation had been documented, and could be reported, it was difficult to miss certain "changes." Now, I do not own a crystal ball, but perhaps this news gave some folks reason to pause and reassess. And I will leave it at that. In all honesty, royalfan, I do not recall you calling anyone out recently. You had to know who the other person(s) was/were who were playing games. We all know who it is. And her friends as well. There are quite a few names that are now AWOL and some new names besides Annett. One in particular is quite entertaining. So I think it's more likely that the reassessment is complete. And it's ridiculous. We're all supposed to be adults here but you'd never know with all the stupid games being played. I separate that from people who post anonymously because they've got their reasons for not putting a name down. One or two people over time have made some sense that way. Even then I think if you're going to vent away on the interwebs you ought to stand behind what you say. But we all know there's a cadre who think they're really smart and think they can fool everyone into thinking they've left when they haven't. I await your nose, honestly and sincerely. Let's see if my decoder ring and your nose are sympatico. Oh, I have done so, bluhare. My way may be more subtle, but I have, and I will. Recently, you stated that identities may change, but styles and tone do not (something along those lines). I agree. And my nose knows when to twitch. Enough said. I didn't want to answer to royalfan but there was a reference which I couldnt pass. When Charlotte started blogging I used my name but after Pauline, I was Anon. And then I picked up blue. This year I decided I go back to my original one. Am I mocking you royalfan? I did. But I would say this, I didn't agree with you many times. You became Pauline. With a different intensity but very similar attitude. Implying that I am one of the person who insulted Charlotte or anybody here, or changed my names other than the above mentioned is not TRUE. This is one awful lie. I can't understand how you dare to accuse me without any proof. In the future I ain't comment on anything you say. That is my answer to you and anything you say. Bluhare thanks for the few words. But I think you waste your time and energy. Sadly. Anett, I'm sorry that you felt you had to reinvent yourself, and yours is a reason I understand. Don't necessarily agree with, but understand. I hope you didn't think for a second I meant you when I was talking about people playing games. I didn't. (And I didn't know you were blue 27 either; so much for my detective skills!!) That being said, I don't run around looking for it. Some people just pop out, especially when they've said they're never ever darkening this place's door again, sometimes several times! Other than that I don't particularly pay attention. There's so many Anonymouses and people changing their Anon signatures it's not worth the time and energy. Wow. 17 comments since last night (in my time zone)in the George post, all anonymous and looks like 11 of them could be from the same person judging by the posting times. Is your nose twitching, royalfan? My decoder ring is boinging. Seriously do not feel bad. I have never thought changing my name would be such a big deal. Especially because I do not mean any harm except for one person seemingly. Thought using my name is a sign of a trust and seemed to be a good idea. I have never played games if I wanted to address anybody used my moniker but never Anon. That's all left in me. No worries, Anett! I look forward to meeting you in Vienna to share some Mozart Kugeln!! It's just so difficult to choose one. I really like the Seraphine Blue Coat and that outing was on my 16th birthday. Kate was really glowing that day and it has been one if my favourite looks! I also like the McQueen Coat for the Church Service in March, the Beulah Blue Coat, The coat she wore for Trooping the Colour and the black coat by the private dressmaker, to name a few! The details of the trip will be released by the Palace soon, I hope! For me, the clear standouts this year were white coats! I eventually picked the Christopher Kane. The interview was wonderful. My husband and I watched it, and we loved it. Prince Charles was very accessible, and most charming. Loved his descriptions of being seasick long ago. Also nice to see home movies of him as a toddler with his Mummy. There were some very sweet moments. William and Harry were such fun and engaging. What a great contribution the Princes Trust has made these past 40 years, and how it has impacted young people's lives for the better. Well done, and amazing that Charles had the foresight to establish the trust when he was so young. I loved seeing the party in Scotland, beginning with the cocktail hour, dinner and then the singing. Thank you Charlotte for posting the video. It's lovely looking back at all her coats! She has so many :) Didn't she look amazing when pregnant too, beautiful hair and that little bit of extra weight really suited her imo. I'm 37wks at the mo and can't imagine looking as blooming and lovely as she did towards the end! I love this post, so funny to look back at all the coats Kate has worn during 2015. I don’t know how I was able to vote because they’re all great. I chose the bespoke Christopher Kane one just because it fits The Duchess' figure so well and it’s a very beautiful piece. Another favourite of mine is the bespoke Alexander McQueen Kate wore for Princess Charlotte’s Christening, a very princessy and regal coat. She looked amazing! One of my least favourite piece is the SportMax coat that she wore at her visit to the Action for Children’s Cape Hill Centre. I want to say thank you to you, Charlotte, for your work in the “Reply-Kate” page, thanks to you I was able to find a lot of “Kate- inspired” pieces that then I received as christmas presents from my family! Thank you for the documentary link. I watched it last night. It was informative - I had heard of The Prince's Trust but had no idea what it actually was. I enjoyed the interview with William and Harry. I thought they tensed up at one point when it looked like a question was going to be about their mother, but immediately relaxed when it wasn't. William seemed genuinely cordial, as opposed to the interviews I've seen before where he appears to hate having to answer questions. Good to see. As to the poll, I voted but, as others have said, it's so difficult to choose just one! I watched the documentary and enjoyed it very much. Charles has done very good work and impacted many lives in a positive way and I do give him credit for that. Additional thoughts... the nature of the program shows that the emphasis is very much on him and his role, with Camilla being in a supportive role. Not unlike Kate, IMO. It was so hard to make a decision! She really has an amazing coat collection; I am so jealous. I voted for the Christopher Kane but I love several of the choices listed here. Charlotte, thank you for posting a link to the documentary. It was so interesting to see the PoW at work and to hear him talk about how much more he wants to do. He really seems to be a likable guy who is on a mission to help better the lives of others. He seems to be genuinely passionate. I think that this was an excellent PR move. How darling are Prince William and Prince Harry?! It was really nice to see the two of them interact in such a relaxed setting. Well, it's back to work for me! Take care, everyone! What an incredible selection, I would like to vote for many of them!! I would have voted for the McQueen coatdress ... but it is more dress than coat so I went with the Mulberry Cerise coat. I think bright colours look very flattering on the Duchess. The muddy browns and and green less so. I surprised myself. I was going to vote for the Christopher Kane but ended up voting for the Reiss Emile. I know it is a lesser quality coat but the bright color and perfect fit won me over. Kate wore many pretty coats this year but, I feel, a proper fit issue plagued her much of the time. I couldn't vote through Blogger, but I would have chosen the McQueen cream christening coat. Immaculate, elegant, radiant. 2nd place would be the recycle Hobb's dalmation coat and third would be the green Sportmax christmas coat. She looked amazing! Still couldn't vote, but I would have selected the Catherine Walker brown coat. The entire look was just perfect. Thanks for the link to the Ant & Dec program. I actually found it to be a bit...uncomfortable. It seemed more of a fan tribute than the documentary-style program I was expecting; although I am not familiar with Ant and Dec so maybe that's why it struck me as a bit off key. The Prince of Wales comes across exactly as I expected. Princes William and Harry were surprisingly candid and spirited and I enjoyed their banter. I understand completely why the Duchess of Cornwall doesn't give interviews. The Cheryl Cole portion was close to cringe-worthy. I loved getting a look at the royal homes and grounds. And finally, the program did a lovely job of highlighting the various programs supported by the Princes Trust. The real stars of the program are the participants/recipients of Trust programming/grants! The pink Alexander McQueen, the Dalmatian coat (SO happy she brought both back, two of my favourite pieces from her pregnancy with George! ), I also simply love the cerise Mulberry coat, such a fresh and amzing colour that looks just great on Kate and is something dfferent from many things she usually wears, another favourite is the blue Reiss coat, also a fabulous colour and a great cut! I am very surprised by the popularity of the Christopher Kane coat, which did not fit well. I debated about the christening outfit, but much as I love it, it is really a dress. I ended up voting for the dark green SportMax coat which was a beautiful choice for Christmas and was wonderfully styled. I also very much like the Mulberry cerise coat. I am amazed that those two and the black Alexander McQueen for Remembrance Sunday did not receive more votes.